This is a great formula for people on mission to build up their Jing. Microcosmic Orbit is an important and very useful formula used in the Taoist and Chan (Zen) Buddhist traditions to supply energy to, to open, and to regulate the primal energy channels and to promote the flow of energy in these channels. Microcosmic Orbit is extremely centering and empowering. It also has an "astringent" quality, which means that it prevents the leaking of Jing. Microcosmic Orbit is composed of herbs that consolidate energy in the primal channels of the body and prevent it from "leaking." In so doing, it helps to build Jing energy in the body (by preventing the loss of Jing). This is a great formula for people on mission to build up their Jing. It must be used simultaneously with appropriate Jing tonic formulations that actually increase the amount of Jing in the body. It may also be used by those who currently have an abundance of Jing within their system, but who are being subjected to stress or are actively engaged in significant sexual activity. The formula may also be used by athletes with great effect. It prevents exhaustion and builds both physical and mental endurance. 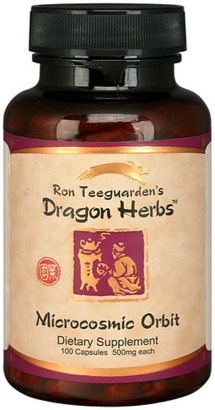 Astragalus Seed, Ligustrum Fruit, Cuscuta Seed, Lycium Berry (Goji), Schizandra Berry, Plantago Seed, Rubus Seed and Polygala Root are all "astringent" herbs. They reduce the loss of Jing and also reduce the leakage of fluids from the body, including sexual fluids, perspiration and so on. In so doing, the precious bodily fluids are conserved. Together, these eight herbs are used to tonify the energy of the Microcosmic Orbit, the vastly important energy channel that circulates along the central line of the body, up the back and down the front creating a complete "orbit." It is believed as a basic principle of Taoism, Traditional Chinese Medicine and Qi Gung that if this channel is healthy, then the whole body is healthy. It is traditionally believed that when these eight herbs are combined into a formula, that sexual pleasure will be enhanced greatly. Microcosmic Orbit is a major anti-aging formula. Astragalus seed, ligustrum fruit, cuscuta chinensis seed, goji berries, schizandra fruit, asian plantain seed, rubuschingii fruit, polygala root.